In the early 1920s, physicist Léon Theremin was doing research on proximity sensors for the Russian government. He was trying to develop something like a land-based sonar device using an electromagnetic field to detect objects that entered a certain zone. Instead, Theremin came up with a musical instrument: his namesake, the theremin. He demonstrated his creation to Russian leader Vladimir Lenin, who was said to have "adored" the new instrument [source: Beckerman]. Lenin sent Theremin on a world tour to show off the new technology, and Theremin delighted audiences throughout Europe with his "ether-wave" concerts. Theremin eventually found his way to the United States, where he patented the "Thereminvox" in 1928. Hailed as the world's first electronic instrument, avant-garde composers like Joseph Schillenger immediately recognized the potential of Theremin's device. 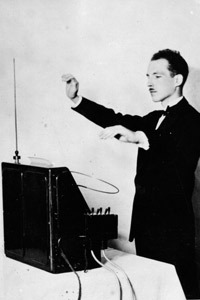 In 1929, Schillenger premiered his "First Airphonic Suite" in New York City, and his theremin soloist, Léon Theremin, became the talk of the town. RCA quickly snapped up manufacturing rights to the Thereminvox and hatched an advertising campaign designed to sell a theremin for every living room in the country [source: Beckerman]. Although RCA's "Theremin" was a commercial failure, their 1930s-era device is still considered by many to be the holy grail of theremins [source: Michael Rogers]. In a time before electric guitars and synthesizers, the theremin amazed audiences with its seemingly magical capabilities. Virtuoso performances by theremin masters like Clara Rockmore and Lucie Rosen ensured a loyal cult following for the instrument. In 1954, before he began work on the synthesizer that bears his name, Robert Moog's company, the R.A. Moog Company, began producing theremins. From there, the instrument's following grew even larger, and it became associated with eerie wails in science fiction films [source: Theremin.info]. Today, the theremin still enjoys a dedicated cult following and appears occasionally in all kinds of music, from symphony concertos to the music of Tom Waits. "The Lost Weekend" (1945): The theremin provides an eerie undertone as protagonist Don Birnam’s alcoholic cravings threaten to get the best of him. "The Day the Earth Stood Still" (1951): Haunting and otherworldly, the theremin’s whine underscores the overall creepiness of this 1950s sci-fi movie.